Last week, I ran in sunny 74 degrees with 80% humidity. 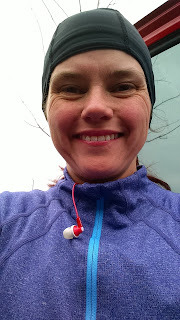 This week, I ran in 35 degree weather with a breeze and overcast skies. Gotta love Tennessee weather! 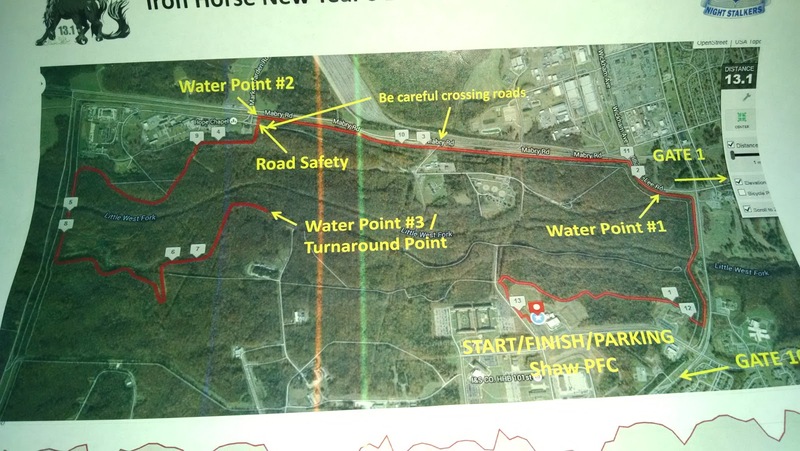 For my long run this week, I went up to Fort Campbell to run the 3rd Iron Horse New Year's Eve Half Marathon. I stopped at the visitor's center to get my visitor's pass and made my way to the Shaw PFC (Physical Fitness Center) to pick up my packet. Some 60-odd people registered for the event. I'm not sure how many showed up. I went out to my truck to drop off my packet and finish getting my gear together. Then back into the warm gym to warm up. It was 32 degrees. It would only warm up to 37. Overcast with a breeze. So, the starred items, I've never worn running before. The socks had only been through a 5 mile training run. Yes, I know the rule about not using something in a race you haven't used in training. We have that rule in endurance riding, too. But seeing as how this was a training run with loot, I figured, why not. So a quick little review of the new clothes. I bought the lululemons from their website after running in my endurance riding winter tights. I went looking for a nice winter running tight with pockets. These tights have lovely pockets. 2 zippered pockets; one on each thigh. The zippered pockets are big enough to carry 2 packages of Shot Bloks (each!) and maybe 3 in a pinch. The tights also have 2 open pockets; one on each hip at the waistband. The tights were too long for me, so I took them to my local lululemon shop and they hemmed them for me for free. These are lovely tights and feel buttery soft inside and out. I was a little worried about all the seams on these tights, but after my half today, I have no worries about that any more. No rubbing, no irritation and they felt great. I put my pack of Shot Bloks in one zippered pocket, my pack of Honey Stingers in the other. I bought the Skirt Sport skirt to go over the lululemons to give a little more modesty. The skirt has these magnets in the front to hold a race bib, but my UA shirt would have covered it, so I pinned the bib to my shirt instead. This race was a chipless race, but I'll have to be careful about the magnets and bibs with timing chips on them. Some chips can be rendered inactive by magnets. The skirt was cute and did its job nicely. I was also happy to have an extra layer on! The UA shirt was comfortable and I love the little zipper pocket on the back. It was perfect to stow my gloves before the start and the single glove that I removed after many miles. I really like the zip to control core temp, although, I must admit, most of this run, the zipper was fully closed! The socks don't fit as well as they should. I got size small which claims to fit size 4.5-7. I wear a 5.5 in street shoes and a 6.5 in Altra running shoes. But these socks were too loose. I don't think I'll wear them for long runs again. I don't recall my feet being cold, but that might just be because I was cold pretty much all over. These socks might just be good for endurance riding, so I will likely move them to that sport. One nice thing about riding and running long distance is that equipment that doesn't work so well for running often works great for riding. On to the run!! We left the warm gym about 3 minutes before the 10 AM start time. I pulled my gloves on, put my skull cap on and kept moving outside. I started near the back. No point in being passed by lots of people. Before the first mile marker, I was pretty much shaken into the position I would hold for most of the rest of the race. I was freezing! Normally I do a run/walk strategy with my Garmin GPS alerts, but I was very cold and kept running. The first mile I ran straight through. The second mile, I walked up a hill and was so cold at the top it took me another mile to get slightly less cold. So I ran as much as I could, walking only when my HR alarm rang at 175 or on hills when I knew my HR would go too high and I'd have to breath too hard. This was a training run, after all. I wasn't planning on a PR. I drank straight water at the first water stop. Since this was a small race, I just stopped and drank and left my cup at the aid station so they wouldn't have to pick up my trash further on. Some of the other races I've been to will have a trash can a couple hundred feet up the course. This one didn't, but I didn't mind. The cold water and the outer cold air didn't do me any favors and I ran a bit harder away from the aid stations to warm back up. The other aid stations, I began to drink straight gatorade. I've been avoiding that, but since I've also been having trouble with my calorie intake, I figured I might as well try it. Around mile 3, I put in my ear bud and turned on my music. It was nice to keep some of the wind from rushing through my brain. Just after mile 4, I passed a lady I'd been following at a distance. We were headed down hill and she was doing the same pace. I sped up to take advantage of the easier going and passed her. I'd done that before, but she'd passed me up the next hill, so I expected that again, but she never caught up with me again. At the turn-around, I noted she was about 1/4 mile behind me. I still expected her to catch me at some point, but she never did. Now I was chasing another girl about 1/4 mile ahead of me. I never was able to catch her, but I kept her in sight until the finish. It was good motivation for me to keep moving to keep her in sight. For the next 2 miles I got to watch people come back at me. I like out and backs for that reason. When I turned around at the aid station, I watched the runners behind me as they headed toward the aid station and me away. 2 runners that I knew were there, but then I was surprised to see 4 more runners. Well, walkers, they were walking when I saw them. That's kinda depressing, too. Here I am running for most of it and walkers can keep up with me. Oh, well, slow poke I am. Around mile 8, I caught sight of a walker in front of me. He was hard to miss as he was a lot taller than me and wearing a bright yellow shirt. It took me 2 miles to finally catch and pass him. That was a bit depressing for me as well. Oh, well, training run, right? At the last water stop, I paused and exchanged pleasant banter with the girls manning the station. They were quite friendly and I enjoyed my brief exchange with them. Then on for the last 2 miles into the finish. The finish was where we began, of course, and unfortunately for me, it was up a slight hill which looks a lot steeper and longer at the end of a race! I got a t-shirt, a knit hat and a dog tag finisher's medal. Not a bad haul for a training run! I love the logo. Another reason I wanted to run this ride, 10 years ago, Rendezvous with Destiny was run on Fort Campbell. This was a one-time 2-day horse endurance ride event. I rode Tanna (my main endurance horse who is still competing) on the 50 mile ride on Sunday. I rode with Joe who was riding Kit (who is also still competing). We had never ridden together before, but we became fast friends during that ride. I thought it was rather poetic to run on the same base (not the same trails) I had once ridden my horse. 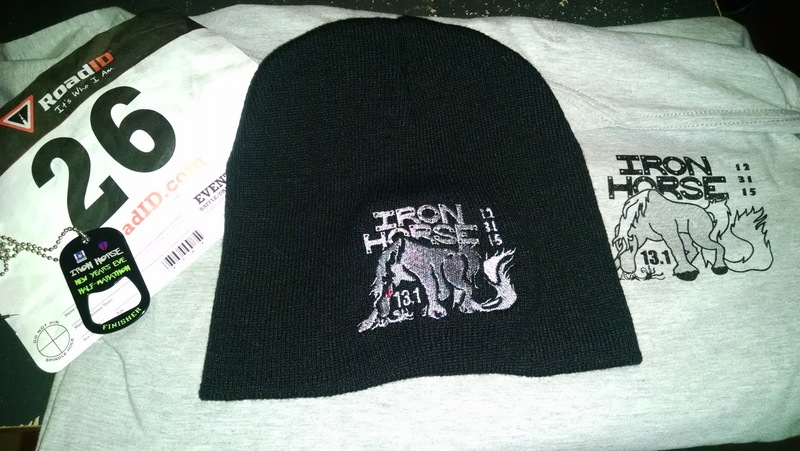 And to have that race be called Iron Horse. It was great and I'm happy to now have my army coin completion award from the endurance ride and my dog tag completion medal from the half.